Below you will find a list of all the SpinEmpire Casino bonuses - offered to new players. The right side offers a casino overview (click to scroll through the images). 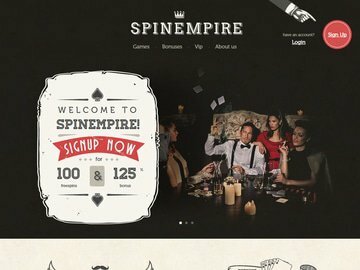 With a thirties jazz and bootlegging theme and a games menu packed with more than 600 titles, SpinEmpire online casino is a popular gambling destination despite only having opened its virtual doors in 2015. Players will encounter only trusted brands, from the reputable operating company, EveryMatrix Limited, to the major software suppliers - Net Entertainment, Quickfire, Microgaming and Betsoft. You can rest assured fair gaming, secure financial transactions, 24/7 support and player privacy are part and parcel of the experience. As the responsive website and instant play games are optimised for use on all devices, there is no need for a dedicated mobile casino. Simply sign up on your desktop, laptop iPad, iPhone or Android handset and tablet and you'll have instant access to endless entertainment. Support for dozens of currencies across five continents and seamless access to multiple universal and domestic banking methods cater for players all over the world. According to recent statistics, Canadians, who can bet and play in CAD, are driving the search for SpinEmpire casino no deposit offers and registering accounts from predominantly English speaking cities such as Vancouver, Edmonton, Calgary and Toronto. A combination of free spins and gratis cash awaits new players at Casino SpinEmpire. To benefit from the complementary code free bonus, simply register an account, deposit at least C$25 and you'll be eligible for 100 free spins on Net Entertainment's Dead or Alive video slot. The free spins are valid for only three days and withdrawable winnings are capped at C$200. Thereafter, you'll earn 125% extra on your first deposit up to C$500...on the house. As you have to request the complementary spins in chat and accept the percentage match SpinEmpire casino bonus during the registration process, bonus codes are obsolete. In addition to the bonus code free welcome offer, returning players benefit from cashbacks and weekly reload promotions. Giveaway alerts are sent directly to players, so no action is required on your part to cash in. Furthermore, your every wager generates complementary points redeemable for cash. These points also determine your VIP status and associated rewards. Reach the top VIP tier and you'll benefit from a plethora of code free promos that include real money cashbacks, turbo withdrawals, extended deposit limits and new games giveaways. SpinEmpire operates on the EveryMatrix software platform and offers Flash casino games by Microgaming, Quickfire, Net Entertainment and Betsoft. You'll have browser based access to more than 400 slots arranged in the classic, video, 3D and progressive jackpot slots categories. There are hot new releases such as Net Entertainment's Stickers slot and all-time favourites that include Microgaming's Game of Thrones video slot, Betsoft's Enchanted slot and Blood Suckers slot from the Netent collection. Video poker, table games and speciality games make up the remainder of the betting menu. The action is available in English only. Players can access the full spectrum of games on their mobile devices. In addition to the responsive design of the website, the software suppliers have optimised mobile slots and table games for the small screen. You'll be able to tap into great progressive mobile slots capable of paying out millions of dollars at a time where ever and when ever you want, from Icy Wonders and Mega Joker to Super Lucky Frog mobile slots and more. If you prefer the challenge of playing games of skill, there are the likes of Mini blackjack and roulette, pontoon and Caribbean stud available in the palm of your hand. Casino SpinEmpire supports multiple currencies that include CAD, AUD, EUR, GBP, USD, ZAR, NOK and SEK. Payments are facilitated via a wide range of global and domestic banking options that vary from Mastercard, Visa, Neteller and Skrill to QiWi, WebMoney and dozens of online bank transfer systems unique to particular countries. Sensitive data is encrypted and stored in secure vaults, the casino adheres to the Data Protection Act of Malta and the entire site is regulated by the Malta Gaming Authority (MGA). A certified random number generator and games and payout percentages deemed fair by independent testing agencies such as eCogra, Technical Systems Testing and Gaming Labs International guarantee fair gaming. 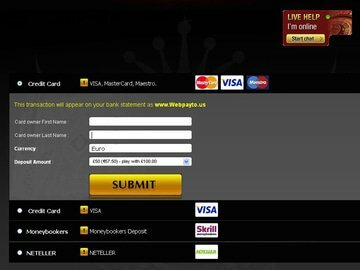 Should you encounter a snag registering an account, requesting a withdrawal or claiming the latest no deposit SpinEmpire casino bonus - where no bonus code is required - you can contact the casino via the live chat facility located under the 'Online Support' tab onsite. The support service is available 24/7. More than 600 instant play games by four major software suppliers provide plenty of action compatible with all devices. There's support for myriad banking methods and currencies, including CAD. The casino has ensured all the security, fair gaming and privacy boxes are ticked but the odd no deposit offer and telephone support would be the cherry on the top. With a responsive design and all the requisite gambling products and services, SpinEmpire online casino gets our thumbs up.